Current mirror with adjustable gain. The current mirror is a well known circuit in electronics. It provides a output current which is proportional to the input current. Figure 1: the basic form of a current mirror. The input current (I1) causes a voltage across the base-emitter junction of T1. This voltage is also applied to the base-emitter junction of T2. This will cause a collector current in T2, which is almost equal to the input current I1. I write "almost", because I1 contains two times the transistor base current, and I2 not. 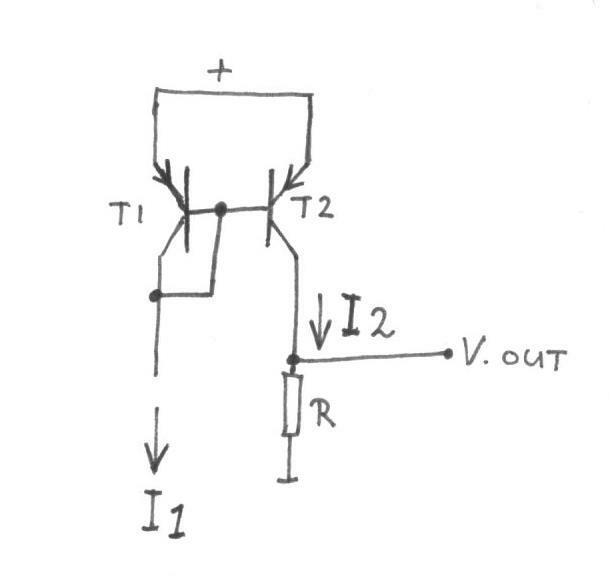 And transistor T2 can have a higher base-collector voltage then T1, which can give some change in current gain. Besides that, T1 and T2 can have different hfe values (current gain), and temperatures, which will all effect the gain of the circuit. But anyhow, the current gain of the circuit in figure 1 is about 1. Resistor R converts current I2 to a voltage. What is much less known, is that the gain of a current mirror can be made variable by a small DC voltage which changes the base-emitter voltage of T2. Figure 2, the gain of the current mirror is changed by a small DC voltage. 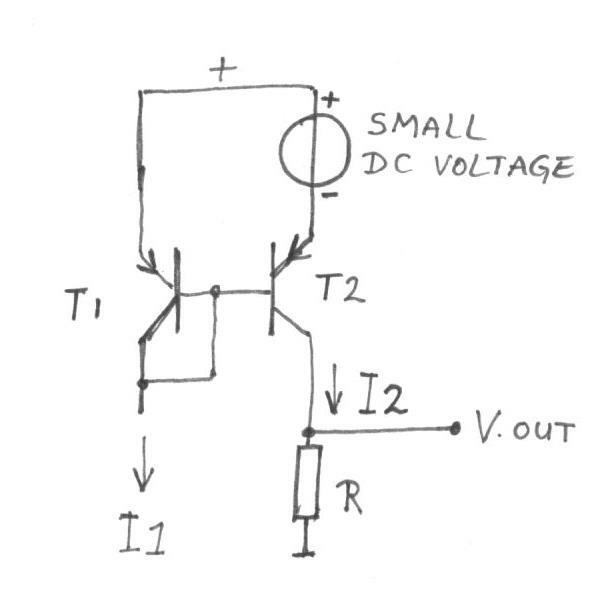 In this example, the DC voltage is in series with the emitter of T2, but you might as well place it in series with the base of T2. With the DC voltage polarity shown in figure 2, the gain of the current mirror will reduce below "one". If the polarity is reversed, the gain increases above "one". For an explanation of the working of this circuit, we take a look at the relation between base-emitter voltage, and collector current of a transistor. Figure 3, This diagram shows the relation between Vbe (base-emitter voltage) and Ic (collector current). Because I use BC560C transistors in the current mirror, we look at the lower curve. Please note that the Vbe scale is linear, and the Ic scale is logarithmic. For this transistor, the curve is a straight line up to about 5 mA, this is the region in which both T1 and T2 must operate. As an example, the input current of T1 changes between 1 and 2 mA, indicated with the green lines. This gives a certain change in Vbe (about 25 mV). Then we subtract some DC voltage from Vbe (in this example about 50 mV), and come in the region indicated with the red lines. We see the output current of T2 will vary between 0.2 and 0.4 mA. If the curve is a perfect straight line, the output current is an exact replica of the input current, without distortion, only with reduced amplitude. Next we have a look at a circuit I designed using this principle. It is an audio attenuator, with a gain adjusted by a DC current. Figure 4, an audio attenuator with a variable gain current mirror. Transistor T3 converts the input audio voltage to a current, which goes to the current mirror. T3 has a DC current of about 2 mA. T1 and T2 form the current mirror, with there bases connected together. For AC voltages, the emitters are also connected, via C3 and C4. The transistors T1 and T2 are mechanically mounted to each other, to reduce temperature differences between these transistors. Here you can see the datasheet of the used BC560C transistor: datasheet_BC560_Philips.pdf . Transistor T5, is a current source, with a value of 0 to 3.4 mA, adjusted by potentiometer R15. The current through T5 causes an extra DC voltage across resistor R6, and this is the voltage we subtract from the Vbe of T2. Transistor T4 is an emitter follower, which buffers the output signal. The circuit works on 12 volt supply voltage. 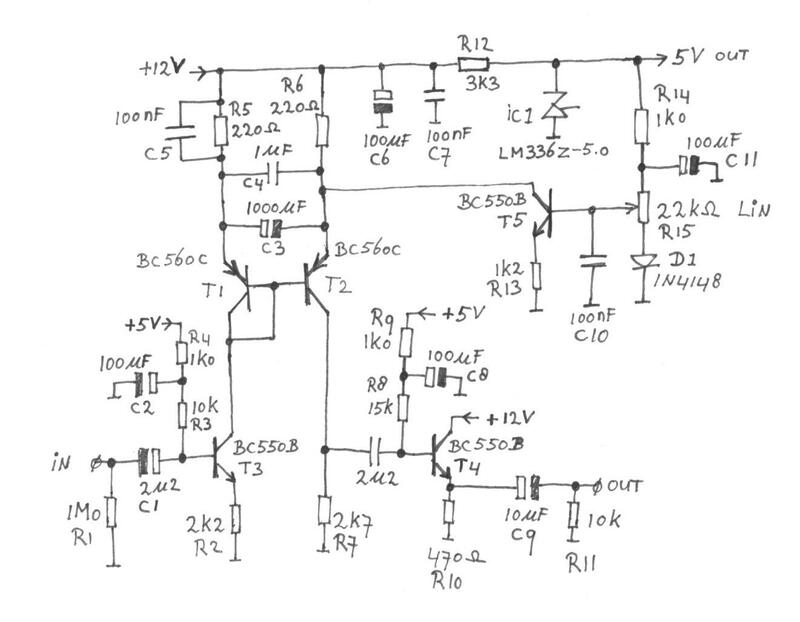 The 5 Volt you see in the circuit, is made with the LM336Z-5.0 voltage reference (IC1) (datasheet_LM336.pdf). 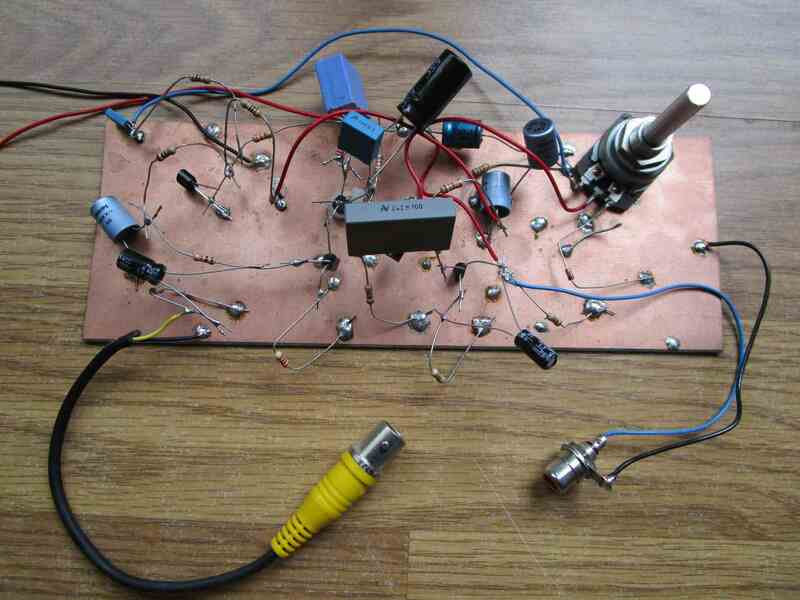 Figure 5, This is the prototype I build of the circuit. The following measurements are made on this prototype. Figure 6, this diagram shows the measured gain of the circuit (V out / V in), as function of the current through T5. Figure 7, level of harmonics measured below the wanted signal, at the output of the circuit. The input signal was 1 kHz, 1 V RMS sine wave with very low distortion (2f < -90 dB). Figure 8, the output signal with an 1 kHz triangular wave at the input. Figure 9, audio spectrum measured with 1 kHz, 1 V RMS sine wave at the input, and the gain set to maximum. Figure 10, RF frequency response of the circuit, at 0 dB, 20 dB, 40 dB, and maximum attenuation. Measured with a spectrum analyser with tracking generator. The picture shows the response from 100 kHz to 5.1 MHz. At maximum gain (0 dB attenuation), the -3 dB bandwidth is 10 Hz - 2.2 MHz. For maximum attenuation at higher frequencies, capacitor C5 (100 nF) is added to the circuit. 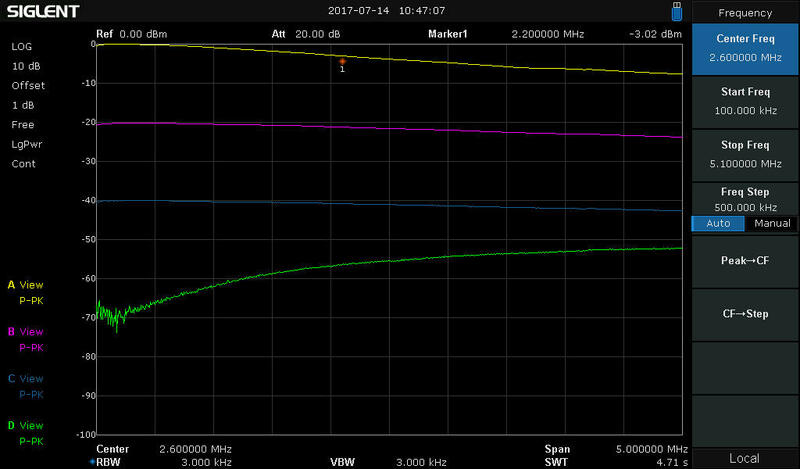 With C5, the maximum attenuation at 2 MHz is 57 dB, without C5 it is 50 dB at 2 MHz. For the rest C5 has no function, or influence on performance.